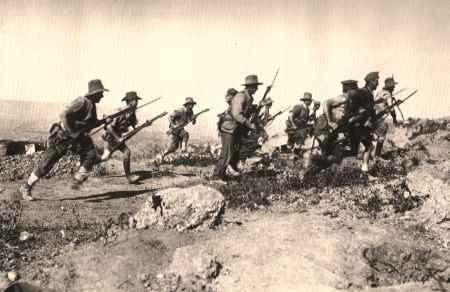 AIF troops in a bayonet attack near ANZAC Cove, Dec-1915. This article originally appeared 25-Apr-1997 in, and is copyrighted by, The West Australian. The slaughter that began on 25-April-1915, has come to symbolise the birth of Australia as a nation. The few survivors of that conflict cannot even march now, but every succeeding generation keeps their flame burning. As we sit in comfortable, mostly middle-class Perth waiting for the traditional holiday sportsfest, or enjoying just another day off in this paradise, it would be well to recall what our forefathers confronted all those years ago, not just in the suicidal ANZAC campaign. World War I is called the Great War and the War to end All Wars. It was neither. The fighting, particularly in the rat-infested trenches of France, was eye-to-eye and bloody. Into this hell marched Australians like George Drosen, whose story I have found on the Internet at a site called Trenches on the Web dedicated to a history of World War 1. Drosen was a very ordinary Australian. He was a 34-year-old Melbourne labourer when he joined up in 1915. He stood only 1.64m and weighed about 69kg. He cooled his heels in Egypt as the AIF (Australian Imperial Force) was reorganised after the disaster of ANZAC Cove, and in June 1916 found himself on the Western Front in the battle of the Somme. On 10-Aug-1916 he was chatting to a few other Diggers when a German bomb exploded next to them. All that was found, according to a military record, was "the trunk of a body which was still warm and quivering". George Drosen was one of 416,809 men who enlisted for service overseas in the AIF. About 331,000 actually left Australia. By war's end 58,961 were dead, 166,811 were battle casualties, 4098 prisoners of war or missing, and 87,865 were sick. Similar horrors afflicted all other combatants. Russia lost 1.7 million soldiers, Germany 1.8 million, the British Empire (including Australia) 908,000, France 1.3 million and Austria-Hungary 1.2 million. What was it for? Australians and New Zealanders were called to war to fight for the British Empire which had aligned itself with Serbia, Russia and France against Germany and Austria-Hungary, after a Serb terrorist had assassinated Austria's Archduke Franz Ferdinand in Sarajevo. It fanned the festering tensions of an unstable Europe into war. Australians went voluntarily often in regional and State groups. They believed oppression and territorial ambition had to be thwarted. It was probably a harder act of war to justify than that against German aggression or Japanese territorial ambitions in World War II. But they believed the world would be a better place if they fought for it. No amount of retrospective wisdom or certain knowledge that war is bad is ever going to change what they did. As we have seen, many met ugly deaths in lands they had previously only read about. What emerged was a sadder, wiser Australia, grieving for far too many. Eighty-two years on we have a vastly different world of course; ravaged by many wars and atrocities. In Australia it sometimes feel like a cesspit of political deceit, snouts in the public trough, crime, drugs and fear-mongering against those regarded as some sort of enemy within. But it is still paradise compared with much of the world, and one worth standing up for. I hope we never forget the Diggers who were so innocent and brave, nor the disasters into which they were propelled. We should all learn from their ANZAC spirit.